Description: In the spring of 1941, the population of the Whooping Crane—pure white with black wingtips, standing five feet tall with a seven-foot wingspan—had reached an all-time low of fifteen. Written off as a species destined for extinction, the whooping crane has made a slow but unbelievable comeback over the last seven decades. 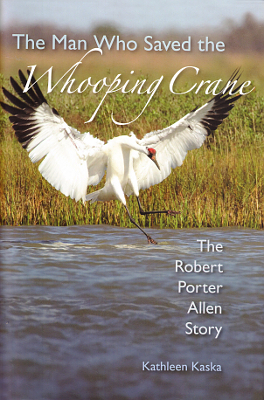 This recovery would have been impossible if not for the efforts of Robert Porter Allen, an ornithologist with the National Audubon Society, whose courageous eight-year crusade to find the only remaining whooping crane nesting site in North America garnered nationwide media coverage. 234 pages. Viewed: 3,421 times since October 25, 2012.